August 10, 2007 Henry Cabot Lodge Bohler, former Tuskegee Airman, died. Bohler was born in Augusta, Georgia in 1925. 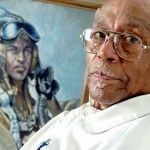 He enlisted in the Army Air Force at the age of 17 and trained at the Tuskegee Army Air Field, earning his wings in 1944. Bohler remained with the air force until 1947, rising to the rank of second lieutenant. After leaving the military, Bohler graduated from Hampton University and moved to Tampa, Florida where he became Tampa’s first African American licensed electrician. In 1960, Bohler and his family were denied entry to the Lowry Park Zoo in Tampa and Bohler sued the city for discrimination. The suit resulted in a 1962 federal order requiring Tampa to integrate its public recreation facilities. ← August 9th in African American History – Isaac Lee Hayes, Jr.